When Ivan the Great, the first Czar of Russia, died in 1505 AD, he left Russia just beginning to be an important power in Central Asia. 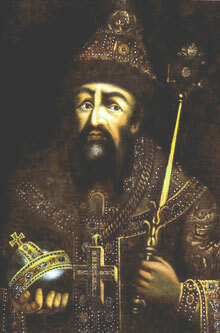 Ivan’s son Vasili, who succeeded him when he was 26 years old, conquered even more of Lithuania. In 1526, Vasili divorced his wife and remarried against the wishes of the Orthodox church. (It was in the same year that Henry VIII in England began struggling with Church approval of his divorce; perhaps he had heard of the Russian decision?) But in the end Vasili was able to remarry without losing the support of the bishops. Vasili died in 1533 at the age of 54, and his wife Elena (originally from Serbia) ruled for the next five years as regent for their 3-year-old son Ivan. Elena was 23 years old when she got power; maybe it helped that Hurrem Sultan was so powerful in the Ottoman Empire to her south. In 1535, Elena created a unified money system for Russia. She also negotiated treaties with Lithuania and with Sweden. 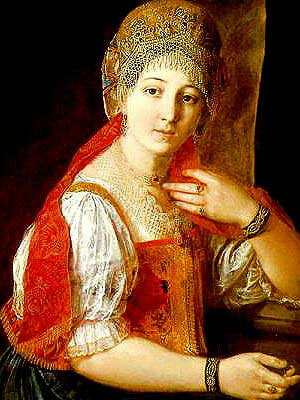 But in 1538 Elena died, possibly poisoned by the Russian lords, who took over the regency. When Ivan turned sixteen and took power, he was a strong and ambitious czar like his grandfather Ivan (even though he looks a little frightened in the picture!). Rich people in Russia hated Ivan, because he killed many lords in order to get all the power for himself. They called him Ivan the Terrible. But Ivan ran Russia well: he wrote new laws, created a representative council, and reduced the power of the Church. Ivan also expanded Russia to the east into Siberia, conquering Muslim people and making Russia into a combined Christian-Muslim country. But after Ivan died in 1584, his son died with no children, leaving Russia weaker. The continued Little Ice Age caused famines and made things worse. Poland got more and more power over Russia. Finally in 1613 things began to get better: the Russians fought off the Polish army and a national assembly elected Michael Romanov to be the new Czar. Cite this page: Carr, K.E. Ivan the Terrible – Russian History. Quatr.us Study Guides, May 30, 2017. Web. April 23, 2019.